The best way to farm parashroom for tranq bombs and other paralysis tools in Monster Hunter World. You’re going to need a lot of tranq bombs in Monster Hunter World if you plan on capturing monsters for bonus rewards, and they don’t come cheap. A core component required in the crafting of tranq bombs (and other paralysis tools) are parashrooms, a yellow mushroom with a paralysis effect. Knowing where to find and how to quickly farm parashrooms is going to help cut down on unnecessary grinding. 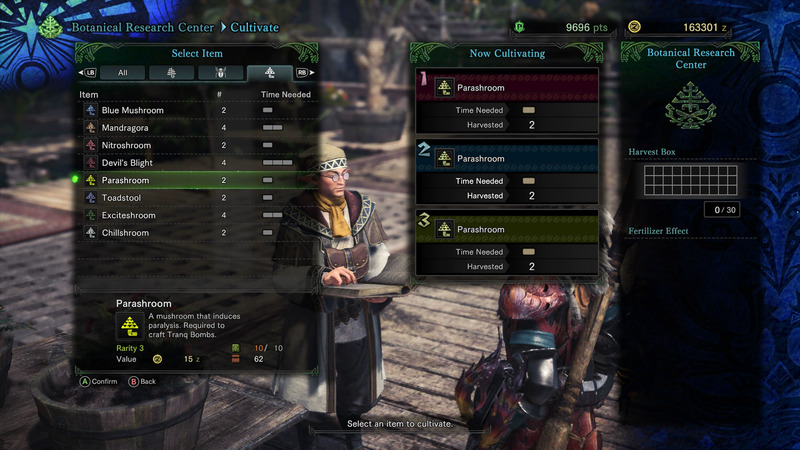 Parashrooms are required in the crafting of several items in Monster Hunter World with the most used among all hunters being the tranq bomb. If you’re a hunter who uses long-range weapons to hunt all the monsters in Monster Hunter World, you’ll be needing parashrooms for paralysis coating and paralysis ammo. As for how to actually farm parashrooms, the best place to find them is the Rotten Vale or by speaking with the scientist at the Botanical Research Center. The Rotten Vale is a dangerous environment, full of poison and hostile life forms – like the brutal Odogaron – but also home to a large collection of parashrooms. In Area 7 you can find a collection of 7 parashrooms, and because each mushroom gives you two, you can make off with 14 parashrooms. To reach this area, start at Central Campsite 11, climb up the nearby vines, jump down and climb up the next set of vines and head right. Here you will find a collection of parashrooms ripe for gathering. If you haven’t made it to the Rotten Vale, you should head to the Ancient Forest, as this is probably the safest place to find them. There are two locations where you can find two bunches of parashrooms, Area 2 and Area 11. 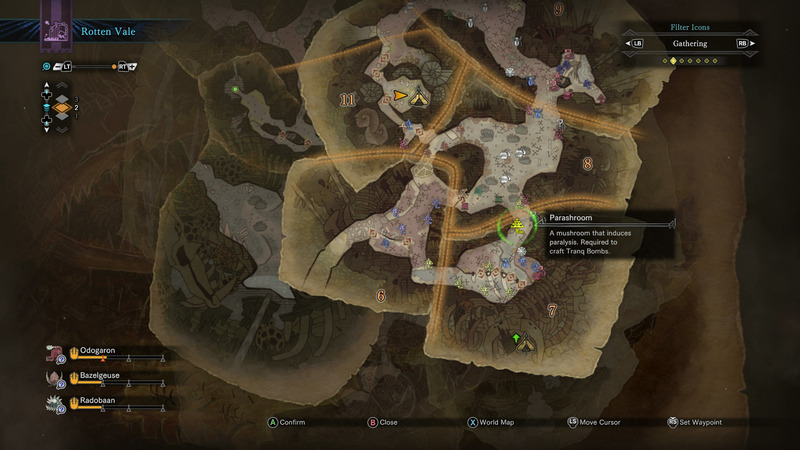 Similarly, you can find three parashrooms in the Wildspire Waste in Area 5. Arguably the most efficient way to collect parashrooms is to grow them at the Botanical Research Center. You will unlock this vendor in Astera as you progress through the story. The Botanical Research Center can be used to cultivate various plants and life forms for harvesting, including the parashroom. You won’t be able to grow parashrooms as soon as you unlock the Botanical Research Center, you will have to wait until you complete the mission, One for the History Books, the 10th main story mission. With this completed, visit the scientist and begin growing your own parashrooms, saving you the hassle of going out and farming them in the wild. When you first start Monster Hunter World, collecting parashrooms can be a time-consuming process, as you’ll need to find them, collect them, and then wait for them to regrow. As you progress through the main story, you’ll be able to simply grow them yourself without breaking a sweat! Be sure to check out our Monster Hunter World guide for more insights into the various materials and collectibles in the game.